Your life becomes much easier if you hire the right kind of help for the job, and a commercial electric service can help you cut back on the stress of running your business. This applies whether it’s a renovation, extensive repairs or regular maintenance. A reliable commercial electrical contractor can handle the job in a way that gives you the peace of mind to focus on your other tasks. A residential electrician or general contractor may seem cheaper, but the results might not be what you want. It’s not worth cutting corners when it comes to your business’ electrical needs. If you’re going to have electrical work done, a commercial provider can make sure it’s done right the first time. Experience in the business sector means they will know how to install the system’s components correctly. They’ll do it in a way that adapts to code requirements, helping you avoid costly fines and malfunctions in the future. Your electrical expert will draw up plans for you to ensure that everything gets done in the safest, most efficient way possible. Beyond the install, commercial electrical services can identify potential problems. A power outage is always a costly nuisance, but it becomes even more of a hassle when the cause isn’t clear. You could end up wasting valuable time and money trying to discover the source of your outage. Luckily, you can avoid this by enlisting the aid of commercial electric services. They can pinpoint the exact issue, cutting back on the likelihood of it occurring again. If you’re running a business, odds are you have equipment that must work properly throughout the day. Unfortunately, the world around us doesn’t always cooperate with what we need. Inclement weather and power line incidents are only a couple of factors that can lead to sudden power outages. Your commercial electrical provider can help you avoid getting left in the dark without your most essential equipment. They can help you put together a system with standby emergency generators that ensure your equipment runs the way you need it to, even during an outage. If you elect to save money by not choosing preventative care, you could end up spending much more down the line on emergency repairs. 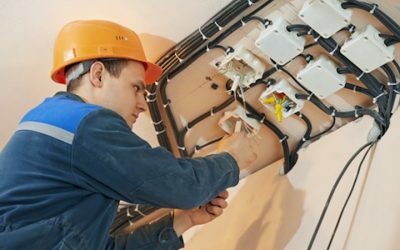 Commercial electric service can provide you with a maintenance plan that will help you avoid many potential electrical problems before they can happen. This not only gives you peace of mind but also ensures that your business will suffer fewer setbacks due to electrical malfunctions in the future. Time is money, and the less time you spend waiting on repairs, the better. Call Bryan Electric at (770) 680-2144 to learn how our commercial electric service can help you and your business. We’re happy to answer any questions you might have, so don’t hesitate to give us a call!